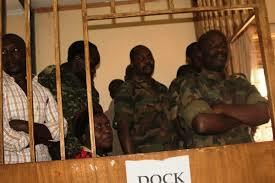 KAMPALA- Court has today convicted four out of 14 people charged over the 2014 failed attack on Kabamba Army Barracks. Lt Col Philip Frank Eguma and Capt Hillman Bosco Aleper both formerly of the Armoured Warfare Training School in Mubende, Lt Ronald Waibi Mwavu, a junior officer formerly from the 4th Division and Pte Kenneth Sekajja, formerly of Air Defence in Nakasongola individually admitted to the offences which attract a maximum penalty of death. Through their lawyer, Lt Brian Moogi, the convicts pleaded for a lenient sentence. “Confession is a sign of remorsefulness and this should be rewarded to the convicts. We pray that court considers the time spent on remand and convicts being first time offenders, they should be given short time imprisonment,” Lt. Moogi pleaded. The court chaired by Lt. Gen. Andrew Gutti has set February 26 for sentencing. Prosecution led by Maj. Raphael Mugisha asked court for a deterrent punishment arguing that the offence committed by the convicts is of grave nature. He also invited the court to consider the fact that one of the convicts, Lt Mwavu has a criminal record of absence without leave during tenure of service. The admissions leave 10 suspects on the charge. A total of 14 prosecution witnesses have since testified in the case. The group has been on remand since 2014.